Summary: A good walk to the mountain which will always be associated with the fight for rights for access to our countryside. 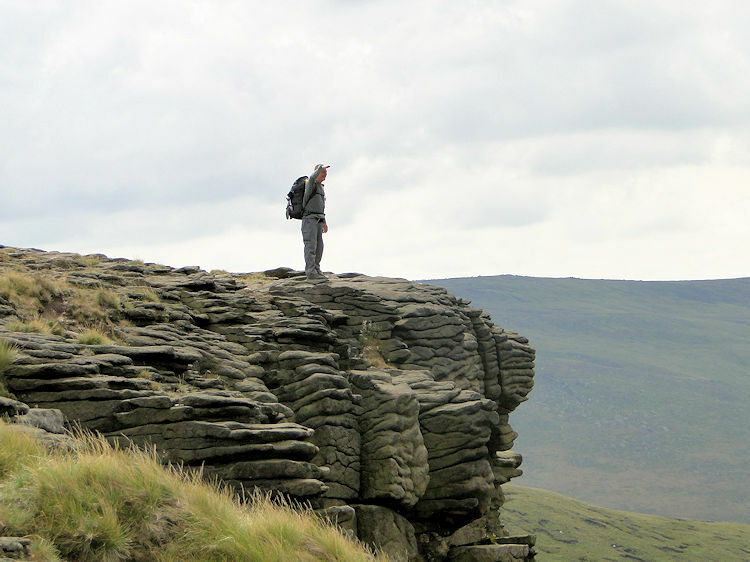 Now we have unlimited access to Kinder but it took brave souls from the Manchester and Sheffield areas to gain our just rights to walk in freedom in our high places. 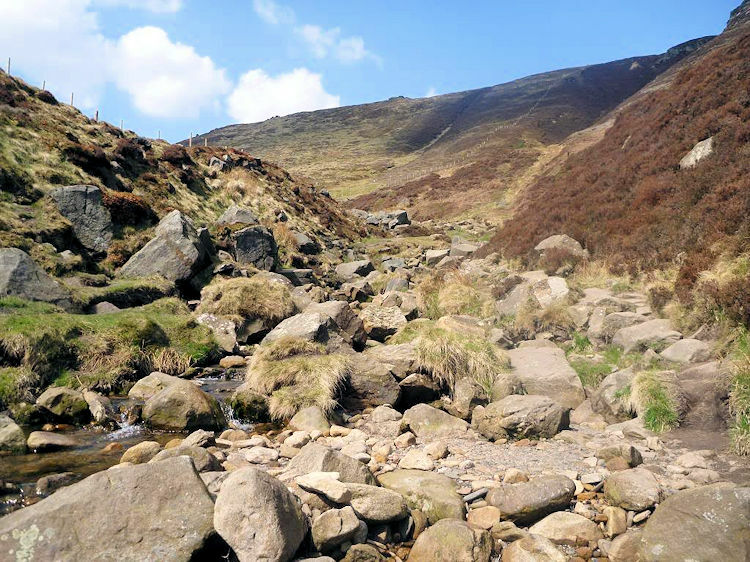 Think about that when you heave yourself up the unforgiving rocky narrow valley of Grindsbrook Clough to Edale Moor and then across to Kinder Downfall. At least you can revel in the views you have earned as you rest before following the edgeside path to the trig point which is a delight amidst all the weirdly shaped gritstone outcrops. 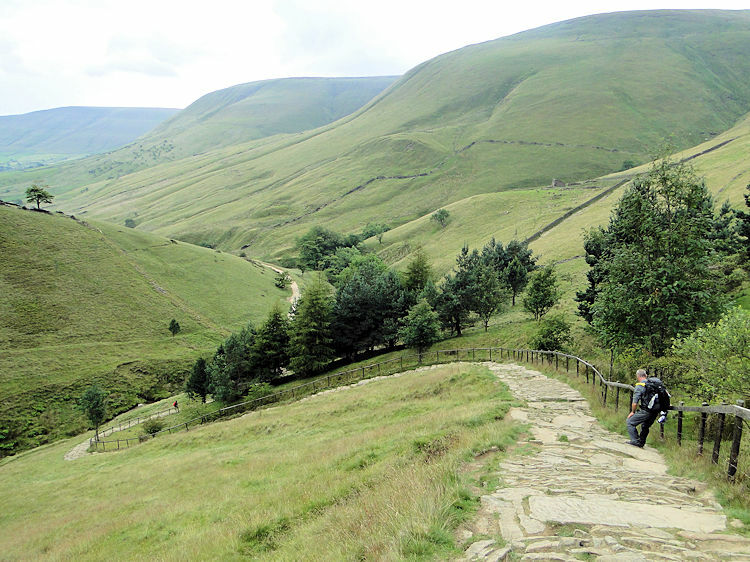 Finish the walk by walking down the hard steps of Jacob's Ladder back to Edale. This is a good day out indeed. Important Note: We did this walk in high summer and in good extended dry weather conditions. In bad weather and particularly in winter this walk is a tough undertaking, especially on the outward journey to the summit which crosses watercourses, peat hags and unforgiving boggy ground. The summer of 2000 was Steve's swansong season in the north before moving to Somerset so he, Dave and I took the opportunity of a few days break to walk in the northern Peak District. We stayed in New Mills for the five day break which was an experience in itself. I will always remember the good nights out we had in New Mills. And we did enjoy some decent walking too in a spell of fairly dreary weather. 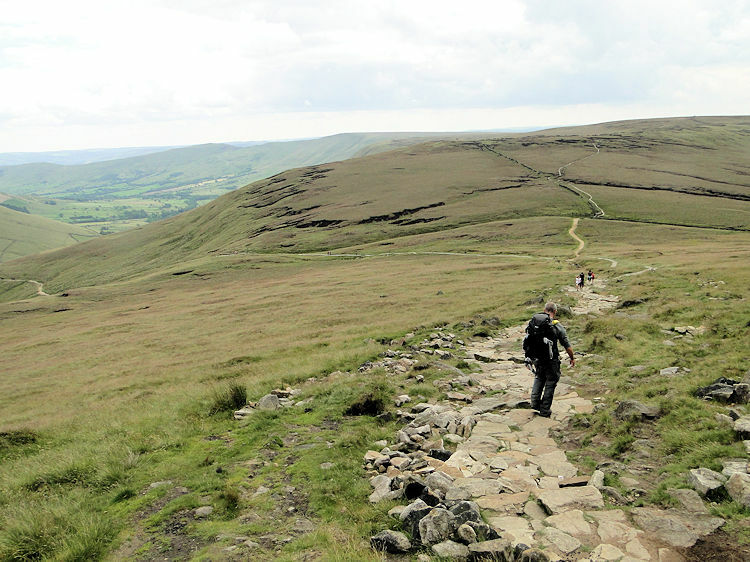 This walk to Kinder from Edale was the best. It was on the only dry day of our visit. 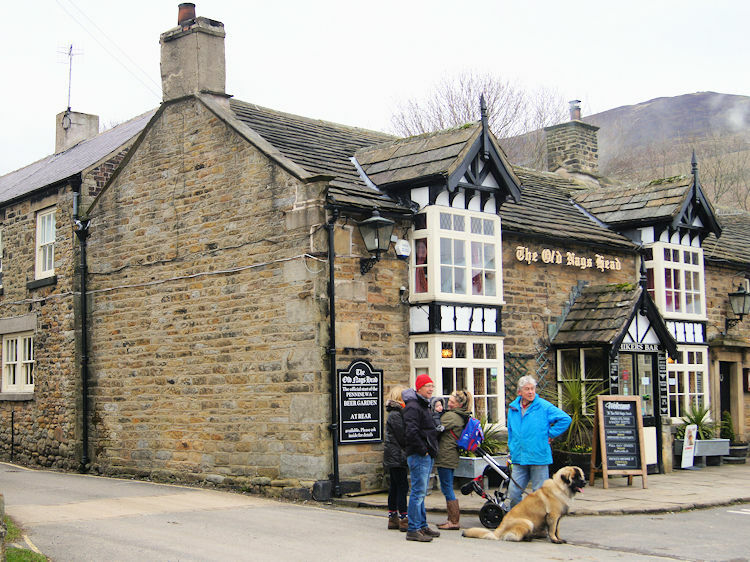 After a usual night of good ale and good fun we arrived in Edale in good spirits and after kitting up we began our walk from the village by following the dead end road up the village past Grindslow House onto Edale Moor by following Grinds Brook upstream. It was a tough walk along Grinds Brook and we were soon sweating off the beer as we climbed over bogs, and through them to Crowden Tower and then to Crowden Head. The lush ground underfoot served as a trampoline propelling us upward but often as we got euphoric the trampoline skin would give way and sink our feet into the earth. Feet emerged sodden in mud and green moss but spirits remained high. 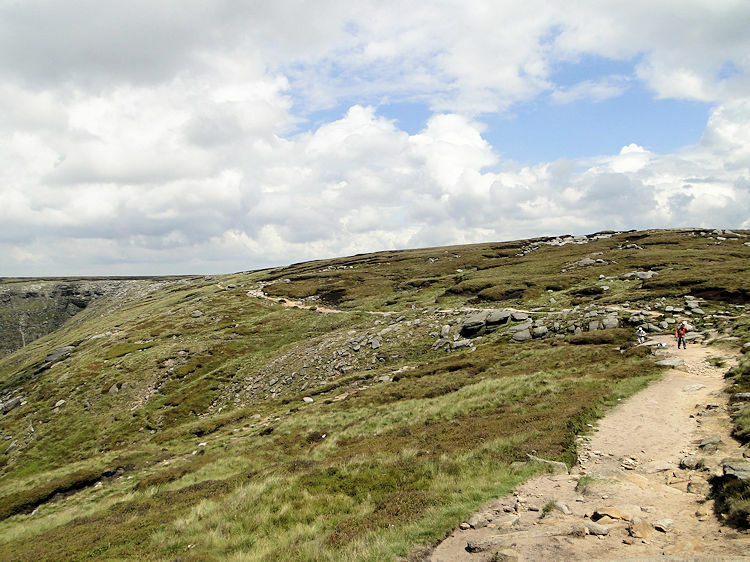 We continued on level ground to firmer ground at Kinder Downfall. Only 100 minutes had passed since setting off from Edale and all the height had been gained. We were chuffed if a little fatigued as the sunshine and the previous nights beer worked to drain us of our early morning high spirits. No matter, we were now at the top of Kinder and could enjoy the brilliant views to Kinder Reservoir down below us in the west. 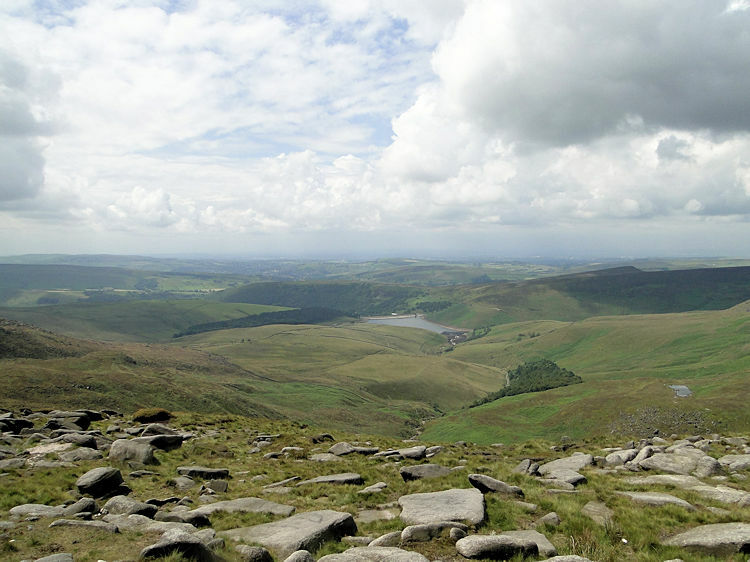 We stayed at Kinder Downfall for a good while relaxing in the heights of the Dark Peak before making our way gambolling southwards along the Pennnine Way path which followed the ridge to Kinder Low and Noe Stool. 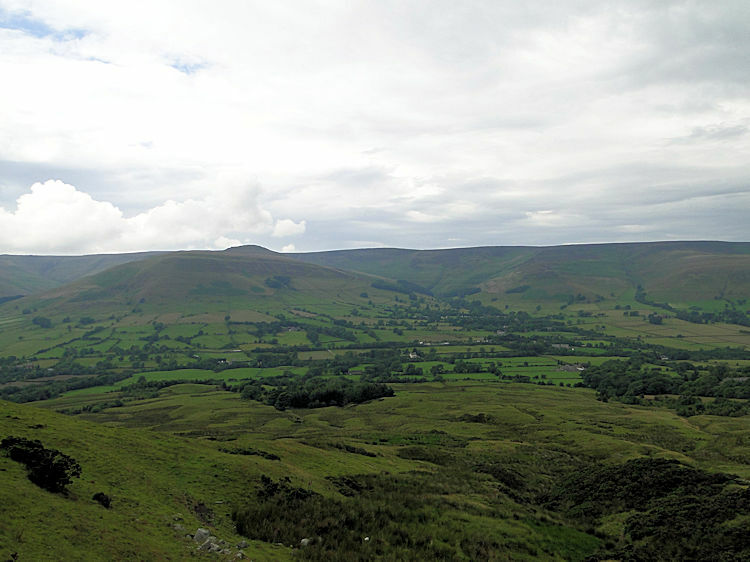 This joyful section of walking on the Pennine Way took us further south to Edale Cross before we turned eastwards and walked down Jacob's Ladder to Lee House and then to Upper Booth. It was on this section of descent that one of my knees buckled, a consequence of the bog trotting and vigorous trampolining! I stuttered down like a geriatric for the rest of the walk vainly trying to keep up with the two mountain goats ahead of me. After Upper Booth we reached level ground which eased the stress on my suffering knee. 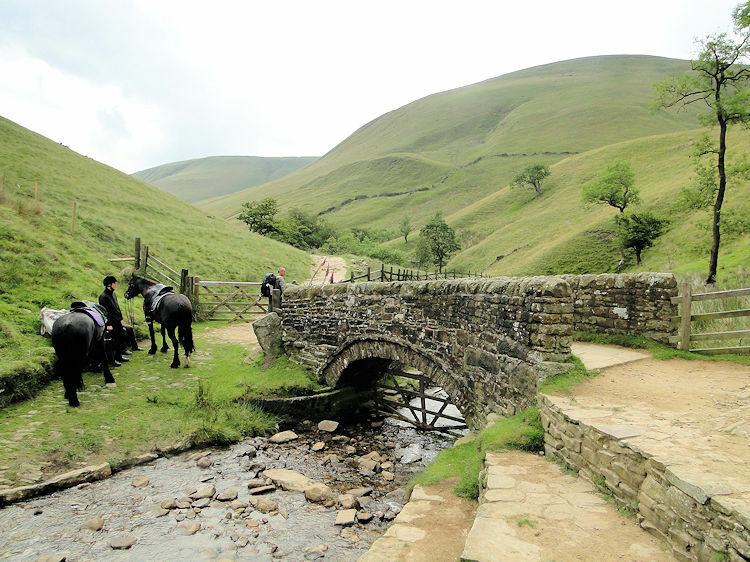 Consequently I did not feel so bad and got back to Edale in one piece. 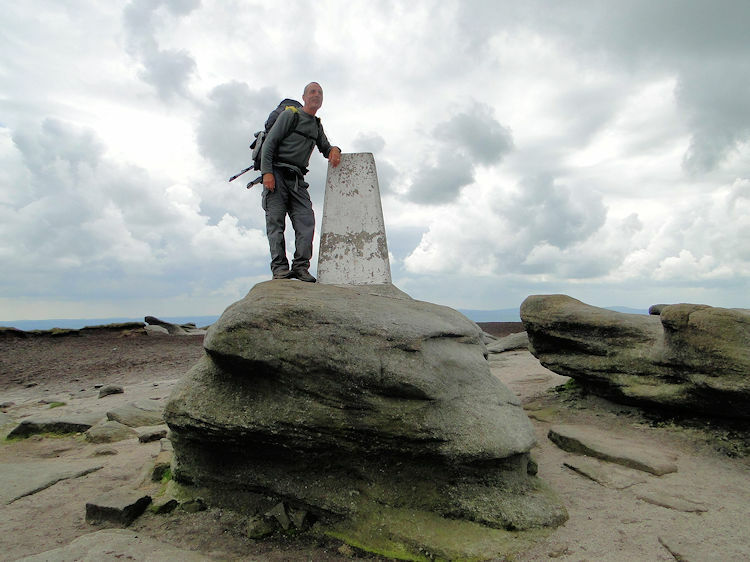 It had been a great day on Kinder Scout despite the knee job. A super walk done and after more lubricating beer in the evening my knee was back on form for the next challenge.